NEW YORK, New York, June 12, 2017 (ENS) – The 193 Member States of the United Nations agreed by consensus to a 14 point Call for Action that will begin the reversal of the decline of the ocean’s health at the conclusion of the first-ever United Nations Oceans Conference. 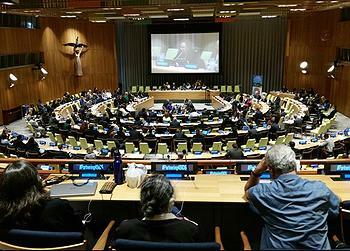 The week-long conference, which closed Friday, addressed key topics for our common future with the oceans. The oceans generate employment for over 200 million people, and are the primary source of protein for three billion people. The Earth is mostly water, and 97 percent of our planet’s water is in the oceans, which cover the majority of the planet’s surface. “In small island states like Fiji, trash will outweigh fish by 2050,” he told the 6,000 conference participants from governments, small island nations, civil societies, nongovernmental organizations, corporations and scientists. Fijians set the stage using the native ceremonial kava ritual, and from opening to the closing the barriers that usually divide those in suits from bare chested or Hawaiian shirt-clad participants were broken down. The barriers between those living island life with the primal intimacy of the ocean and nature, and those living in the concrete sea of urban areas seemed to melt away in a common concern for the health of the oceans. Goal 14’s targets were explored through concept papers and side events on: marine pollution, coastal ecosystems, ocean acidification, biodiversity, overfishing, marine preserves, illegal, fishing industry subsidies and the World Trade Organization, small scale artisanal fishing and economic benefits to Small Island Developing States, ocean energy, shipping, the Law of Area Boundaries of National Jurisdiction, and the Law of the Sea. All of these topics play into the equation of ocean stewardship. Many solutions were presented in a myriad of side events. Solutions ranged from innovative ways to clean up ocean plastics on a large scale, to re-planting coral at reef scale, to tracking whale migration using drones to better understand their needs. A solutions panel was held every day during the conference in the media zone. One of the most challenging issues, the cutting of fishing subsidies, was left in the hands of the World Trade Organization. 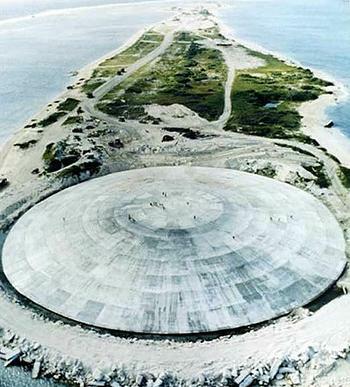 The conference bustled with news of problems, like the Runit Dome in the Marshall Islands that is leaking radioactive nuclear waste into the South Pacific waters, a result of nuclear testing by the United States. There were many solutions proposed such as the Seychelles no plastic law banning the use of plastic bags, bottles, plates and cutlery, and solutions from island regions who shared their approach to creating and policing Marine Protected Areas. The Outcome document, and 1,328 Voluntary pledges registered as the conference closed create an arena for the words to take shape in actions. 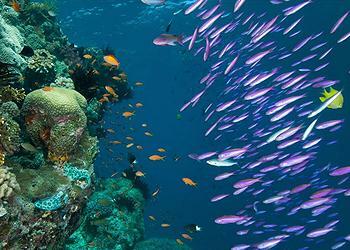 The hashtag #SavetheOceans allowed the Oceans Conference to have a presence on social media. Attention to the humanity’s role in the oceans crisis to become aware of the problems and learn about solutions was achieved. Instagram alone showed more than 56,000 ocean posts, a tide that changes the landscape of traditional media. The commitment to the SDG14 is open on-line, and all are encouraged to participate. “Governments can’t do it alone” was stated throughout the conference by various prime ministers. This “Multi-stakeholder Partnerships” approach to allow governments to team up is a formula devised to make the UN’s efforts more effective. It was noted in the Plenary that just half of the global military expenditure of governments would be enough to achieve all the Sustainable Development Goals. Ocean icons like Dr. Sylvia Earle shared a panel with Trammell Crow. They offered their insights into the degradation of the oceans over the years. Fabien Cousteau described the state of the oceans in which 90 percent of large fish species have disappeared due to overexploitation, 50 percent of corals have died where there is ever increasing acidification. In an interview with ENS about the financial mechanisms needed to turn proposals into solutions, such as the Green Climate Fund, green bonds or carbon offsets, Thomson expressed optimism. 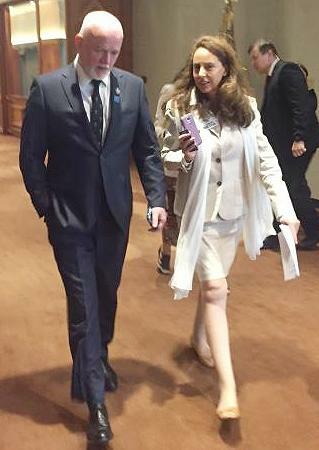 “I am confident that with the broad support from member states and other stakeholders with concrete actions we can save our oceans,” Thomson said.